Former Texas and USC opposite Ebony Nwanebu has signed a professional contract to play for Büyükçekmece in Istanbul, Turkey. The three-time All-American shared that she was living her dream via twitter on Aug. 16. I wish I could go back and tell 9 year old Ebony that all her dreams will come true. Because your girlie is moving to Instanbul, Turkey next week to be a “professional volleyball star”. The three-time All-America selection (first team in 2013 and 2016, honorable mention in 2017) notched 212 kills (2.52 per set), while hitting at a .345 clip and adding 78 blocks (0.93 per set), 36 digs and 21 aces as a senior. In 2016, in her return from a season ending injury, the Fairview, Texas native managed 479 kills (4.03 per set), while hitting at a .273 clip and serving up 25 aces. Defensively, she chipped in 140 digs (1.24 per set) and 73 blocks (0.65 per set). 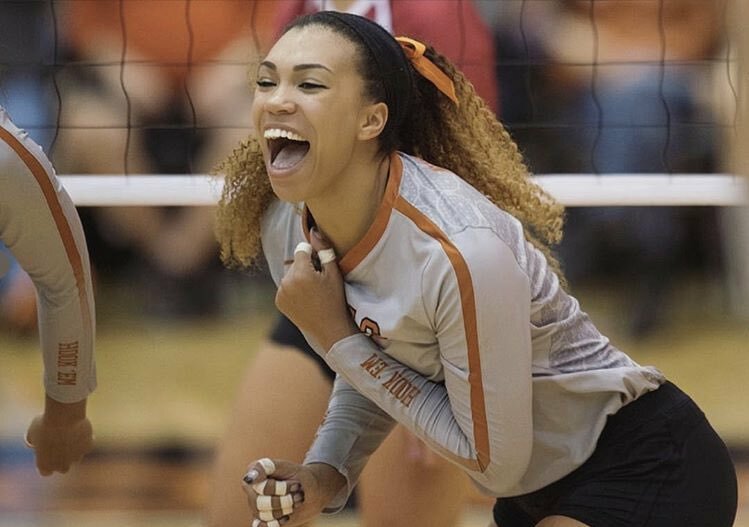 Nwanebu transferred to Texas from USC following the 2014 season, but played in just one match, posting 22 kills, 17 digs and four blocks vs. Nebraska on Sept. 4, before missing the rest of the season. At USC, Nwanebu posted 3.47 kills and 0.82 blocks per set as a rookie en route to first team All-America, AVCA Pacific South Region Freshman of the Year and Pac-12 Freshman of the Year honors. In 2014, she played with the U.S. National Team at the Montreux Volley Masters Tournament in Switzerland, earning a silver medal. She went on to turn in 3.12 kills and 1.44 digs per set, while hitting .226 and adding 55 blocks and 17 aces. All told, Nwanebu posted 1,406 kills, 427 digs, 308 blocks and 61 aces, while hitting at a .321 clip. Nwanebu said hello to the team’s fans upon her arrival. Nwanebu was among the alumni that returned to Gregory Gym for the Orange-White Scrimmage on Aug. 19 pitting past players against the current Longhorn team.